In the past couple of weeks, we went through the car shopping process. The task was to replace our aging and ailing 1997 Oldsmobile Cutlass Supreme with a newer, more reliable car. In the process, we had a great opportunity to learn all about negotiating big ticket items. In this post, I'll tell you about one mistake and three smart moves that we made in shopping for and negotiating the price of our car. In the description that follows, you might tally more mistakes and more smart moves, but I'm trying to keep this post simple so as to highlight the principles at play. First, let's begin by describing the mistake. We needed a new car in the short-to-medium term, but we also needed other things like furniture, and we have a lot of start up costs in our new Colorado home (getting new driver's licenses, getting internet, buying a lawnmower, etc.). Because of the long list of things to do with our new house, my wife and I went car shopping somewhat on a whim. It was one of the things we were doing that day, but it wasn't the only thing we had on our list. Shopping on a whim isn't necessarily a mistake, but the consequence is that we did not know the blue book trade in value of our 1997 Olds. And, walking into a discussion about prices and trade in value without that information is a mistake. When it came time to talk prices at the dealership, they have you fill out a form, and perhaps the most important line on the form is "What do you think the car is worth?" As the salesman was inputting our responses, we sort of shrugged and said, "I don't know." As a result, the dealership appraised the car at much lower than the blue book (we looked it up later), and that set the tone for subsequent negotiations over the price. With that mistake out of the way, let's discuss some smart moves. Smart Move #1. Be mindful of appearances. Car salesmen make their money by figuring out who has the means to afford a more expensive car versus who doesn't. If you come into a car dealership in an Armani suit, the salesman is going to nudge you in the direction of the higher end vehicles. If you come in wearing work boots and dirty jeans, they're going to direct you to their bargain 4x4 trucks. As discriminatory as it sounds, salespeople are profiling you the instant you drive up to the dealership. They do this because it allows them to engage in price discrimination, which as we know from the theory of price discrimination increases profit. For our test driving day, I wore my contacts rather than my glasses and I shaved my stubble because both choices make me look younger. I also wore my Montana State faded screen t-shirt (over 5 years old, fraying on the collar and fading lettering), which gave off a small town air. In addition, whenever possible in the discussion, I showed my ability to calculate percentages in my head to indicate level-headedness. Combined with the fact that we drove onto the lot with a 1997 Oldsmobile Cutlass that hadn't been washed and still had dry leaves under the windshield wipers, we gave off the impression of budget shoppers who had to have a good deal, or else we couldn't swing the payments. In addition, we brought recent credit reports to the table, signaling some level of preparedness. It is a tight line to walk between "we want a good price" and "we can't afford this car," but I think we struck the right balance. My evidence: once we finally filled out our credit application, they were shocked at my monthly salary. The manager actually sent the salesman back to ask me if I had made a mistake and to gauge if I was lying. Fortunately, we had already hammered out a deal, which included some significant discounts from the initial price. Smart Move #2. Leave the negotiation table and sleep on it. One of the best things we did was walk out of the dealership after they gave us a price quote at the end of the first round of negotiation. Dealerships are really good at keeping you at the table for the negotiation until they've gotten you to sign on the dotted line. They do this for good reason: the longer you sit and stare at the numbers they're showing you while you talk about the great features of the car, the better those numbers start to look. No matter how good the numbers look, it is a good idea to leave the negotiation table at least once. The reason is two-fold: (1) It shows the salesman that you're price sensitive and willing to do some research, which is a signal that you're prime for giving a better deal, and (2) It helps you put the numbers and offer in context. In our case, we went home to look up the Kelly Blue Book "fair price" to see if the deal we were shown was really a good one. This also gave us time to look up the Kelly Blue Book value of our trade in. Both actions gave us some concrete figures to use at the negotiation table. It also took us out of the lair of context and anchoring traps that the car salespeople set for us (see Xan's discussion of Chapter 5 of Influence), which enabled us to more clearly see what would be a good deal. Smart Move #3. Shop around. By far the best thing you can do when shopping for a car is to do some additional shopping after the first round of negotiation. We solicited quotes from other dealers, and the net result is that we saved about $750. I would like to take credit for thinking of this in advance, but I can't. In our car buying experience, we came to this smart move by accident. I was trying to get an alternative to the Kelly Blue Book valuation, and I found Autotrader.com, which actually presented us with a concrete trade-in offer for our 1997 Olds. In the process, one of the questions in the survey was "What kind of new car are you looking to buy?" As a result of my answering that question, Autotrader forwarded our information to three competing dealerships to the one where we shopped for the car. I submitted the Autotrader survey at 8 am. At 9 am, I was contacted by a salesman at a dealership about 40 miles away who wanted to know what it would take to get me to travel the 40 miles to do business with them instead. With an actual offer from my dealership in hand, I knew exactly the price they had to beat and I could emphasize that they needed to make an offer that would entice me to drive farther. By 11 am, I had two offers that beat the one that we had hammered out the day before. We went back to our nearest dealership, and they quickly dropped their price to be competitive with our new offers. We saved $750, and dealt with the dealership we liked. 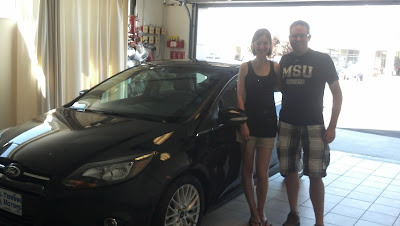 And, in case you're wondering, here's the new car with the happy new owners. Hopefully, my sharing my mistakes and successes will help you in your own negotiations.